Health and Welfare Inquiry Message Forum. FEMA Tropical Storm / Hurricane Info. At 11 PM EDT...0300z...the tropical storm warning is discontinued for Grand Bahama Island and the Abacos in the northern Bahamas. All interests along the southeast Florida coast and in the northern Bahamas should exercise caution until winds and seas subside. At 11 PM EDT...0300z...the broad and poorly defined center of Tropical Storm Harvey was located near latitude 27.5 north... Longitude 77.2 west or about 115 miles...185 km...northeast of Freeport in the northern Bahamas. Harvey is moving toward the east-northeast near 31 mph...50 km/hr... And this motion is expected to continue for the next 12 to 24 hours. Maximum sustained winds are near 40 mph... 65 km/hr...with higher gusts. Harvey is expected to become absorbed by a developing low/ frontal system Wednesday. Tropical storm force winds extend outward up to 60 miles... 95 km ...to the southeast from the center. The estimated minimum central pressure is 999 mb...29.50 inches. Tropical Storm Harvey formed in the Gulf of Mexico from a tropical wave. 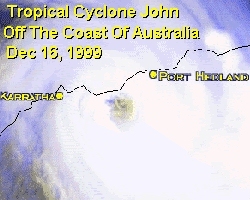 It became a tropical depression on September 19th over the central Gulf and moved toward the east-northeast. In spite of unfavorable winds aloft...Harvey strengthened and became a 60-mph tropical storm while centered about 250 miles west-southwest of Tampa Florida. Taking an abrupt turn toward the southeast...Harvey moved inland on the southwest Florida coast on the 21st and produced tropical storm winds over portions of the Florida Keys and extreme south Florida. Harvey was absorbed by a frontal system on the 22nd just east of south Florida. in the interior of the island. The mountains are about 2.7 km high (9000 ft) and produced what appears to be a huge thunderstorm over the mountains as shown in the blue - upward rising - moisture in the lower image. 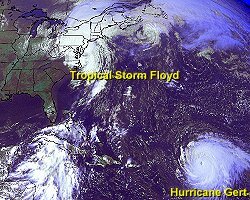 Significant research will be done to understand this very complicated interaction between Hurricane Georges and the mountains. Credit: NASA. The most destructive part of a hurricane is usually the storm surge. 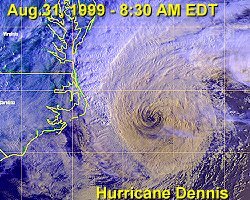 The surge effect is due to the winds of the hurricane pushing up a "dome" of water in front of the hurricane. As this surge of water hits the coastal area tides may be several tens of feet higher than normal. This wall of water works it's way up rivers to cause damage far inland. The rise in water level happens at the same time as the heavy rains associated with hurricanes. The fall of ten inches or more of rain during the hurricane is not unusual. The tidal surge and the rainfall combine to cause flooding. The damage caused by the flooding of property is the largest cost to property owners due to hurricanes. Wind damages bring about the second highest cost, due to the physical power of the hurricane. The costs due to the hurricane just start with the physical damage caused by the hurricane. The general disturbance of every day life activities in any area impacted by disaster bring about costs due to business operations being disrupted. The ability of people to work may be limited due to the shortages of the essential requirements for life, for the need to find replacement housing, for the care of family members injured or traumatized by the disaster, and for the shortage of materials essential for work. There is some delay between the disaster and the availability of funding to begin repairs. Many business within a disaster area do not reopen, because insurance may be lacking to pay for the needed repairs, and even if insurance or loans are available, they may not be enough to cover the required repairs. Damage to essential data stored in computer systems may make restarting an existing business difficult. And any disruption in a business will cause an existing business' clients to seek other suppliers, so that when the business reopens it may find itself with out it's previous patrons. 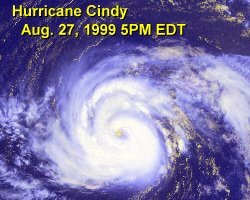 Hurricanes are one disaster in which it is possible to have several days warning prior to the hurricanes arrival. As the arrival of the hurricane can be to some extent predicted, it is important to begin preparations for the hurricane as soon as we have information that it may land in a location near us. Because we can not know exactly where the hurricane will hit, it is important to listen to the local weather authorities. Local weather authorities will issue warnings and announce evacuations. Given a large scale disaster your family may be cut off from any assistance for three days. Every family should have on hand a supply of food, water, personal and medical supplies to last at least 3 days. In any disaster situation it is possible that utilities will not be functioning. For this reason, you should keep on hand a supply of cash and a full tank of fuel in any vehicle. If we live in an area that has a history hurricanes, we can and should begin our preparations for hurricanes long before we receive any notification. Consult local building authorities about any improvements that may be made to your house to lesson the likelihood of damage to the structure. The biggest factor in determining the likelihood of your properties ability to withstand damage due to winds is the date of its construction. In recent years building codes have been upgraded. As a general rule, the older the property the more likely it is to sustain damage in a disaster. Walk around the outside of your property. Inspect the trees and landscaping for objects likely to fall or to be blown away by the winds associated with a hurricane. Consider purchasing storm shutters or pre-purchasing the supplies needed to protect windows from storm damage. Since water damage is the biggest cause of property damage in a disaster you should examine the possibly of purchasing flood insurance. Just because you are outside of the recognized flood zones does not mean your home will not be flooded. The cost of reparing damage due to flooding is not normally covered by most home owners policies, but is the biggest single cause of property damage.